Photographer: Maurizio Bavutti. Model(s): Dylan Foskett, Ine Neefs. Source: i-D Online. Stylist: Jack Borkett. Makeup: Lydnsey Alexander. Hair: Kei Terada. Ine Neefs & Dylan Foskett captures the illusion of nothingness as they head ‘Into the Void’ by Maurizio Bavutti for i-D Online, Spring 2014. Artful and alive, the end feels like the beginning, in this extraordinary view of undaunted pain. Stylist, Jack Borkett, dares to bring us into the fold as fashion pops against the vibrant backdrop of the velvet, green couch. Bound by the beauty of the night, (Makeup Artist) Lynsey Alexander moves forward by using the features of the face to fill out our fantasies. 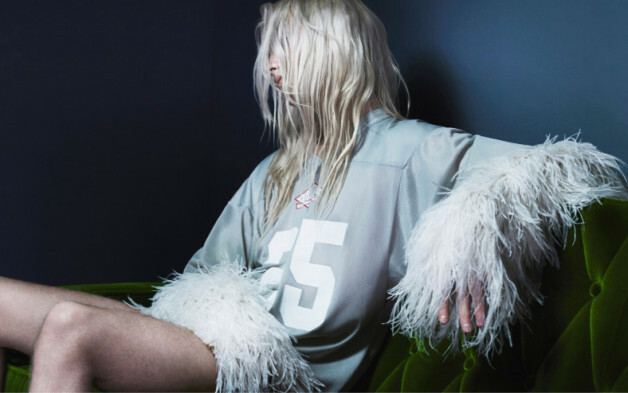 An edgy array of avant-garde play, sporty/chic collide, in this feathered mix of hyper-modern fun. Hairstylist, Kei Terada, mines for madness by turning the sheer shades into spectacles of light. Dark and delicious, as power fights for control, we let go and are overtaken by the aching desire to let love rule.